The scary Yellowstone National Park super-volcano continues to dazzle: scientists have mapped a second magma reservoir that could fill the Grand Canyon 11 times over, giving themselves a clearer picture than ever of what awaits us if the lid blows. Yellowstone National Park in the US draws thousands each year to marvel at the natural hot springs and debate what lies underneath. Even today science has very little idea of how the underground super-volcano connects to the Earth’s mantle below, drawing energy. For years people have feared what might happen if a major eruption happened, with doomsday enthusiasts being particularly vocal about an impending global cataclysm to resemble Armageddon. The new map has taken geophysicists one step closer to figuring out if there’s any truth to those fears. 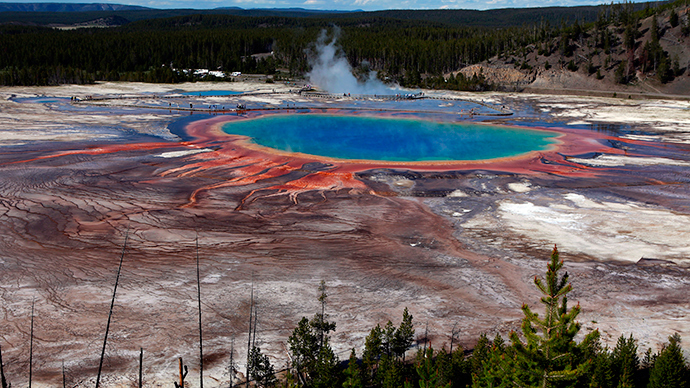 "We can't say definitively that this is the biggest magma reservoir in the world, but we currently don't know of any other that has been imaged that is as large as the two we see beneath Yellowstone," University of Utah’s Fan-Chi Lin told New Scientist. All the mysteries below the park culminate in a boiling hotspot, with chambers and pipes feeding the hot mass from underneath. The Thursday discovery, published in the journal Science, achieved its task by pulling up seismic wave readings from nearly 5,000 earthquakes in the area, arriving at a sub-surface thermal imaging of much greater depths and resolution than before. The reservoir of molten rock is absolutely huge and sits between 19 and 45km (12-28 miles) below the surface. The only other reservoir scientists knew about is comparatively smaller, about 4-14km below ground, housing some 10,000 cubic km of the material. This is what science tells us caused the last eruption 70,000 years ago. By comparison, the newly-mapped reservoir is a monster, containing anywhere between 30,000 to 116,000 cubic km (46,000 cubic miles) of rhyolitic material. As if the smaller Yellowstone chamber wasn’t scary enough, the newly-discovered reservoir is more than four times that size, and could drown the entire Grand Canyon 11 times over. A video below demonstrates the scope and size of the two reservoirs. “Its existence has been suspected for a while,” University of Utah geophysicist Hsin-Hua said of the new find. He is lead author on the study. That’s because far more carbon dioxide is released from the pit than is consistent with the size of the previously-imaged reservoir. That long-standing issue was solved when data from both images were combined to explain the amounts. The imaging was done by sampling seismic activity. In basic terms, researchers glimpsed underground barriers and structures by bouncing seismic information off of them. The velocity of the waves changes when they hit different material densities and temperatures, producing an image. "If you combine the upper and lower crustal magma reservoirs, it better accounts for the amount of carbon dioxide coming out of the ground at Yellowstone," Lin said. The other answer the geophysicists got related to how the gooey material that originates so much deeper could make it to the surface, wowing visitors. The mantle plug found even deeper than the reservoirs – at 60km – answers that question. It “transports heat and magma-containing fluids to the crust above,” Lin says. The new-found reservoir, scientists say, connects the lower plume with the upper chamber, allowing this to happen. "Now we have a much better understanding of how the entire magmatic system beneath Yellowstone works, from the mantle to the surface," Lin adds. Now to the risks: are they any bigger? Probably not, researchers say. The last great eruption took place 640,000 years ago and led to the formation of the giant Yellowstone caldera. Further to that, recent models predict that we’re dead-wrong about there being a huge cataclysm. Instead, they say it’ll be more like one huge, but slow and non-explosive event – nothing like the darkened skies people get from much more violent calderas we see above ground. Also, not all material is molten in the reservoirs, only small fraction of the total, it turns out, making the whole prospect of eruption much less ominous.